Consisting of three spacious, modern cottages, set apart for privacy, amongst lush tropical gardens, Sunbird Gardens is the ultimate relaxation retreat with each cottage having its own deep luxurious veranda spa bath enclosed with louvers for total privacy. Your pet is welcome but please check first. A private Bali inspired gazebo leads from the deck and allows you to enjoy the flowering garden setting and bird life - Sunbirds, Rainbow Lorikeets and Wattle Birds. All cottages are totally self-contained with modern appointments, queen size bed, spacious bathroom and a bright and airy lounge that catches the cool sea breezes. The cottages are air-conditioned for your comfort. Undercover parking is provided, along with linen and towels. Free WiFi is available for your convenience. Suited for couples looking for that quality holiday break, where they can have time out in a quiet and relaxed atmosphere. For a special occasion, they are happy to organise a chilled bottle of champagne for you on arrival. A 300 metre stroll through a rainforest track will take you to Agnes Water Beach, while the town itself is within a short pleasant walk where you can access coffee shops, restaurants and other retail outlets. Sunbird Gardens offers a spacious fully self-contained cottage with queen size bed. Adjacent to main bedroom is a veranda spa bath on the wooden louvered enclosed deck. All linen provided. The kitchen is fully equipped and each cottage has its own back deck barbecue, private gazebo and carport. Cottages are air-conditioned and free Wi-fi is accessible. 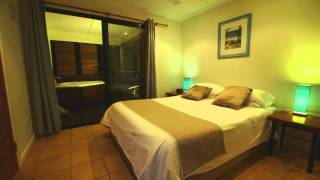 The cottages are located in a tropical garden setting at the end of Joseph Banks Boulevard and it is a 300 metre walk to beautiful Agnes Water surf beach and slightly further to the local shopping precinct.